Jacobus Arminius (also known by his Dutch name Jacob Harmenszoon) was born at Oudewater, Utrecht, on October 10, 1560. He was a Dutch theologian and (from 1603) professor in theology at the University of Leiden in Holland. He wrote many books about theological problems. Arminius is a Latinized form of Herman, a common Dutch name. His father died while Jacobus was an infant, leaving his mother a widow with small children. A priest, Theodorus Aemilius, adopted Jacobus and sent him to school in the city of Utrecht in Holland. His mother was slain during the Spanish massacre of Oudewater in 1575. About that year Arminius was sent to study theology at the University of Leiden by the kindness of friends (Snellius). 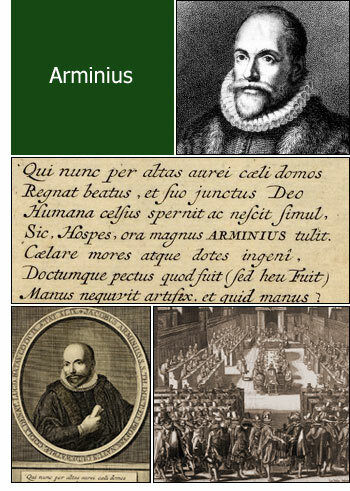 Arminius became the founder of the anti-Calvinistic school in Reformed Protestant theology. Supporters were called Arminians or Remonstrants, was distinguished as a preacher and for his zeal in the Reformed Religion. He attempted to soften the Calvinistic doctrines of predestination, in which he was violently opposed by Gomarus. He counted among his adherents Grotius, Barneveldt (Johan van Oldenbarnevelt), and many of the eminent men of Holland. Other eminent theologians of this period were Drusius and Coeceius. Jacobus Arminius died in 1609.